Planting and harvesting can be a very rewarding venture if you make the effort to do things correctly. You need to take time to plan your operations carefully and be sure not to cut any corners. As sunflowers are a hardy crop and can be very tolerant of drought conditions, there will undoubtedly be many farmers who have planted sunflowers this year rather than maize. Make sure that you look after your crop in order to get the most out of it. Sunflower harvesting can be an intricate operation as the seeds are relatively small. This means that many of the common weed seeds may also enter the combine and be mixed in with the sunflower seed due to the size. This is why it is crucial to try and keep your sunflower lands as clean as possible. Weed seeds mixed in your grain can have a negative impact on your grade and therefore the price that you receive for your crop. Take special care of eradicating all Datura weeds (Olieboom) as these can cause many headaches at harvest time. If you have a large percentage of Datura in your grain some institutions will not accept it which will cause you to have an extra expense of getting your sunflower seeds cleaned. Rather take the time before harvesting to go through your lands and chop out all unwanted weeds. It may save you big expenses in the future. If your crop looks as though it has good potential then it may be a good option to consider giving it supplementary nutrient applications. 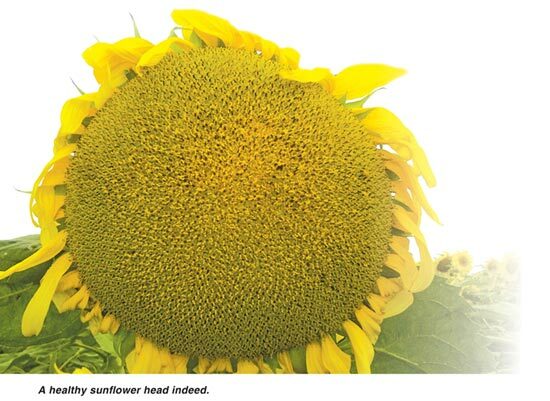 This is usually done by spray at the point of budding just before the sunflower head opens. Many farmers apply folio feeds or Boron chemical spray which can boost the yield of your crop if the conditions are favourable. Once a sunflower head has made seed it is a huge attraction to many pests especially birds such as pigeons and quelea finches. This is why it is important to try and get the crop off the land as quickly as possible. Make sure that everything is ready to operate as soon as the sunflower is dry enough to reap. Many farmers take preventative measure in order to try and curb the damages caused by birds. These measures may include scarecrows, shooting and loud gas cannons which let of big bangs to scare the birds away. These measures may be effective for a short period, but birds quickly learn that there is no real threat and continue to eat their way through your crop. As I mentioned before, timing is everything and you should have all your equipment ready to operate as soon as the crop is dry enough to harvest. Go through all your machinery carefully to make sure that you will have no problems once operations begin. Take special care when working through your combine to make sure that there will be as little wasted seed as possible. This means that your header must be in good working order and the sieves should all be installed and operating perfectly. Make sure to check the blowers and set them correctly so that they do not blow too strong which will also waste seed. Finally, go through all the trailers and trucks which will be carting the grain to check that there are no gaps and spaces where grain will leak out. Have a good plan as to where you are going to sell your product. Make sure that you try to get the best possible price for your grain as profit margins are always slim especially in a drought year such as the one we have just experienced. Keep an eye on the market so that you know the exact value of your product. Always remember to try and get as much as possible out of your crop. This is the only way to make money in agriculture today. Everything comes down to your management and your attention to detail.